Five pupil murals have brightened the corridors of a Northumberland school. Ashington High School students got to grips with the art form in a series of lessons with professional graffiti artist Rob Hutchinson. 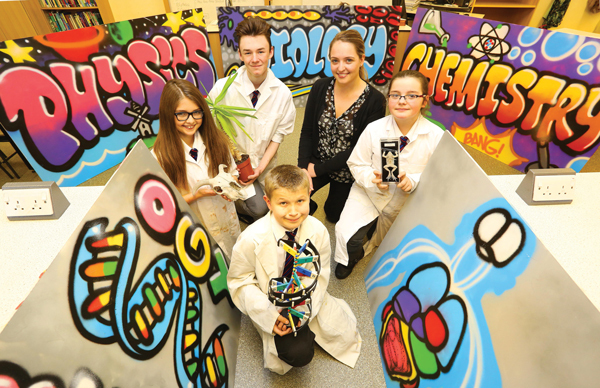 Celebrating national biology week, 20 pupils from years 7 to 10 created large murals depicting fundamental ideas in biology, chemistry and physics. Using techniques such as drop shadowing and 3D lettering, they designed stem cells, test tubes and chromosomes, which all feature in the eye-catching images. All five of the murals are in the corridors of the school’s science department. Jill Traynor, biology subject lead at the school, said: “The idea was to create something reflecting the different sciences in an imaginative and creative way.